The pomegranate tree (Punica granatum L.), native to regions of Iran and Iraq, has been hailed since ancient times for the medicinal properties of its fruit (8, 11). The fruit is sacred in many cultures and medicinal systems, including Ayurvedic medicine (6). 18% of the seed weight is an oil that can be cold-press extracted (12). Over 95% of the seed oil composition is fatty acids (8). Fatty acids are compounds that provide the characteristic “oily” texture of oils. 65% of the fatty acids in pomegranate seed oil are punicic acid, an omega-5 fatty acid structurally similar to α-linolenic acid, a known bioactive fatty acid (8, 10). Present in smaller amounts of pomegranate seed oil are polyphenols, which are anti-inflammatory, anti-oxidant, and anti-carcinogenic (2, 9). The most prominent polyphenol in pomegranate seed oil is ellagic acid (5). The seed oil also has compounds structurally similar to human estrogen that may be helpful for treating menopausal symptoms (7). The major component of pomegranate seed oil, punicic acid, is unique to this seed oil. Punicic acid has anti-inflammatory and anti-oxidant properties (3, 8). It inhibits prostaglandin synthesis (7, 10). Prostaglandins are important inflammatory mediators and are known to induce blood clotting (10). Punicic acid also inhibits lipoxygenase, the enzyme that produces leukotrienes, another important inflammatory mediator (10). It was also found to inhibit the production of inflammatory proteins such as TNFα (3). By inhibiting these pathways, pomegranate seed oil decreases inflammation. The antioxidant activity of pomegranate seed oil is more than red wine and as high as that of green tea (6, 10). An in vitro (outside the body) study shows pomegranate seed oil protects against ultraviolet radiation, particularly UVB radiation, and may help repair sun-damaged skin due to its antioxidant properties (1). UVB radiation is thought to be the most carcinogenic form of radiation (5). Pomegranate seed oil acts as an anti-carcinogenic by inhibiting reactive oxygen species (ROS) that cause DNA and protein damage, which can lead to cancer (1, 3, 9). Another in vitro study shows pomegranate fruit extract containing seed oil reduces death of fibroblasts (cells that make collagen) and decreases the amount of ROS after UV exposure (9). In vitro studies with pomegranate seed oil show it thickens the epidermis (outer layer of the skin) and increases the number of keratinocytes, cells that help make up the barrier function of the epidermis and have roles in wound healing and sun damage repair (2). Since the skin thins with age, pomegranate seed oil shows promise as a topical anti-aging treatment. Pomegranate seed oil has also been shown to have anti-cancer properties. 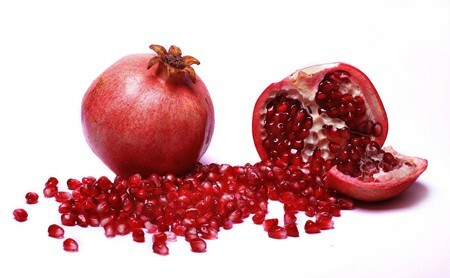 A topical treatment with 5% pomegranate seed oil significantly reduced skin cancer tumors in mice (4). The oil inhibits the action of an enzyme called ornithine­­ decarboxylase (ODC), which is thought to help cancer cells grow (4, 7). Inhibition of ODC can also reduce skin edemas (fluid trapped beneath skin) and hyperplasia (yellowish growths on the skin) (12). In another study, 50μg/mL pomegranate seed oil was shown to increase death of human breast cancer cells (7). The mechanism for this anti-cancer effect has to do with inhibition of cancer cell replication (7). F. Afaq, M.A. Zaid, N. Khan, M. Dreher, and H. Mukhtar, “Protective effect of pomegranate derived products on UVB-mediated damage in human reconstituted skin,” Experimental Dermatology, vol. 18, issue 6, pp. 553–561, June 2009. M.N. Aslam, E.P. Lansky, and J. Varani, “Pomegranate as a cosmeceutical source: Pomegranate fractions promote proliferation and procollagen synthesis and inhibit matrix metalloproteinase-1 production in human skin cells,” Journal of Ethnopharmacology, vol. 103, pp. 311–318, 2006. T. Boussetta, H. Raad, P. Lettéron, M.A. Gougerot-Pocidalo, J.C. Marie, F. Driss, and J. El-Benna, “Punicic Acid a Conjugated Linolenic Acid Inhibits TNFα-Induced Neutrophil Hyperactivation and Protects from Experimental Colon Inflammation in Rats,” PLoS One, vol. 4, issue 7, July 2009. J.J. Hora, E.R. Maydew, E.P. Lansky, and C. Dwivedi, “Chemopreventive effects of pomegranate seed oil on skin tumor development in CD1 mice,” J Med Food, vol. 6, issue 3, pp. 157-161, fall 2003. S.D. Johanningsmeier and G.K. Harris, “Pomegranate as a Functional Food and Nutraceutical Source,” Annu. Rev. Food Sci. Technol., vol. 2, pp. 181-201, 2011. J. Jurenka, “Therapeutic Applications of Pomegranate (Punica granatum L.): A Review,” Alternative Medicine Review, vol. 13, number 2, pp. 128-144, 2008. E.P. Lansky and R.A Newman, “Punica granatum (pomegranate) and its potential for prevention and treatment of inflammation and cancer,” Journal of Ethnopharmacology, vol. 109, pp. 177–206, 2007. I.L.P Melo, E.B.T Carvalho, and J. Mancini-Filho, “Pomegranate Seed Oil (Punica Granatum L.): A Source of Punicic Acid (Conjugated α-Linolenic Acid),” J Hum Nutr Food Sci, vol. 2, issue 1, pp. 1024-1035, 2014. L.A. Pacheco-Palencia, G. Noratto, L. Hingorani, S.T. Talcott, and S.U. Mertens-Talcott, “Protective Effects of Standardized Pomegranate (Punica granatum L.) Polyphenolic Extract in Ultraviolet- Irradiated Human Skin Fibroblasts,” J. Agric. Food Chem., vol. 56, pp. 8434–8441, 2008. S.Y. Schubert, E.P. Lansky, and I. Neeman, “Antioxidant and eicosanoid enzyme inhibition properties of pomegranate seed oil and fermented juice flavonoids,” Journal of Ethnopharmacology, vol. 66, pp. 11–17, 1999. M. Viuda-Martos, J. Fernandez-Lopez, and J.A. Perez-Alvarez, “Pomegranate and its Many Functional Components as Related to Human Health: A Review,” Comprehensive Reviews in Food Science and Food Safety, vol.9, pp. 635-654, 2010. A. Zarfeshany, S. Asgary, and S.H. Javanmard, “Potent health effects of pomegranate,” Adv Biomed Res, vol. 3 pp. 100-129, 2014.